Can a customer have multiple units with one access code? Can they have multiple access codes? Alternatively, if you want to set up a full-screen CCTV display, you can put together a custom viewing profile. Go to Security Cameras -> Camera Setup. The layouts screen allows you to choose one of three layouts for your video streams. Select a layout and then you can assign cameras to different positions. To assign a camera to a position, click edit and select the camera to take that position. All you need to do is add in each camera in turn. Now if you go back to Security cameras -> Camera Setup and then the Magnifying Glass you can see the Camera views. To quickly change between views, just click the relevant frame on the left. If you want to set how often the larger image changes, you can set the change frequency under Viewing Defaults. You can leave this window running on a monitor. Please search or select from the article list. 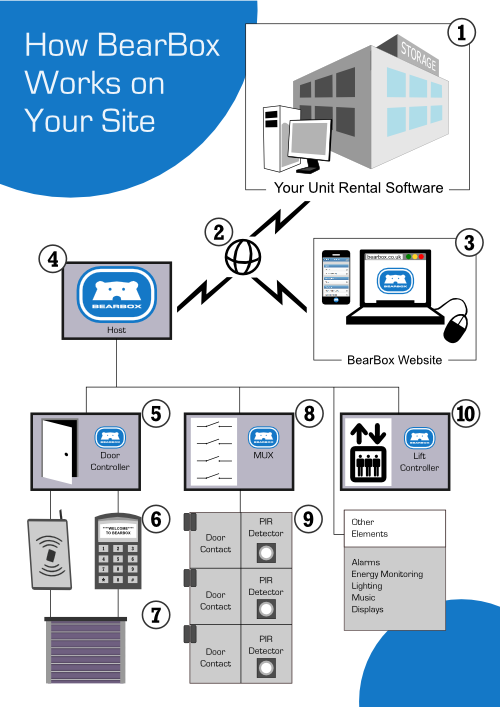 BearBox interfaces directly with your unit rental software via the internet. Customer data and unit rental information is sent to the BearBox server. The BearBox Website is used to set up the customers' allowed zones and access levels. This is also where you can see access logs. The Host holds the database of users, PINs and rented units for the site. It makes all decisions on the site - whether to give access to a user and whether a unit has been opened legally (or forced). The Host carries out all communications with the BearBox server via the internet. It also has inputs and outputs for interfacing with other systems on site – commonly an intruder alarm system. The interface is typically used to disarm parts of the building intruder alarm while a user or staff is on site. The main component that interfaces with users is the Door Controller. By means of a PIN Keypad, Proximity Reader or Biometric ID device, every user requests access from the Door Controller. This then signals the door or gate to open, subject to verification from the Host. The Door Controller also monitors the access door and provides a signal to the Host if the door has been held open for too long. Door Contacts or PIR Sensors. The Mux signals to the Host every time a unit door is opened or closed. The Host then checks whether it is a valid opening (i.e. the user is currently logged on site). A variant of the Door Controller is the Lift Controller. This allows one keypad or reader to give access to a number of floors from within an elevator car, according to a user’s access rights. (only use this if specifically instructed by a member of the support team). Does BearBox require an internet connection? I need a particular function on my site and I don't see it listed. Can BearBox still do it? How does 'Remote Support' work?? Which unit rental software packages are supported by BearBox? Are your systems designed to a particular quality standard? Are you accredited by any trade associations? If you're looking for technical guidance e.g. instructions for operating your BearBox system, see our support page. BearBox does require an internet connection for updates to the user database on your site and to change any settings on-site e.g. alarm sounder timings. It does not need to be online at all times, however, and a loss of internet connection will not cause any issues with normal operation of the site: currently registered users will still be granted access at the correct times and alarms and notifications will continue to perform correctly. It's very hard to give an exhaustive list of the things that BearBox can do. The system and software are constantly evolving to meet the needs of customers with different kinds of site. Because BearBox is so flexible, it's very likely that it already includes the requested functionality - and if it doesn't yet, we'll be happy to talk with you about adding it in! We fix the vast majority of support issues without anyone needing to set foot on your site. On each BearBox installation we include a logging computer which resides on your site and is connected to the network used by BearBox. By remotely logging into this computer we can diagnose and fix software and data issues on your site as well as updating BearBox software. We can also use this method to identify any hardware issues that may require an engineer on site. N.B. The netbook is for support and update purposes only and in no way essential to the proper functioning of your BearBox site. BearBox supports Space Manager, Rent+, Store-IT, Sitelink and others. Whatever unit rental software you may have, BearBox can be tailored to fit your requirements. If you don't have unit rental software for your site, you can even use BearBox's own built in unit rental software, which is always available online as part of the BearBox package. We have quality control systems in place and we use tested components in our installations. We keep records of where we source our components, so that they can be traced. We determine customer requirements and listen to feedback. We have offices in London, but we're an international company with business throughout Europe. To get a quote you can either email us or phone +44 (0) 1932 780010. Estimates are free of charge. 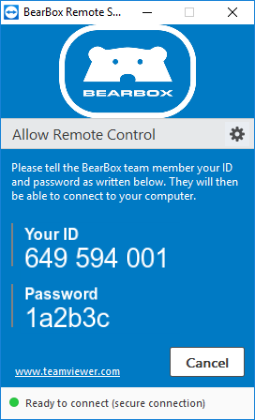 If a BearBox team member has asked you to do so, please download and run the BearBox Remote Support application. The application is a mini version of TeamViewer that will allow us to access your system. It is compatible with Windows, Mac and Linux operating systems. Quitting the application will prevent our accessing.